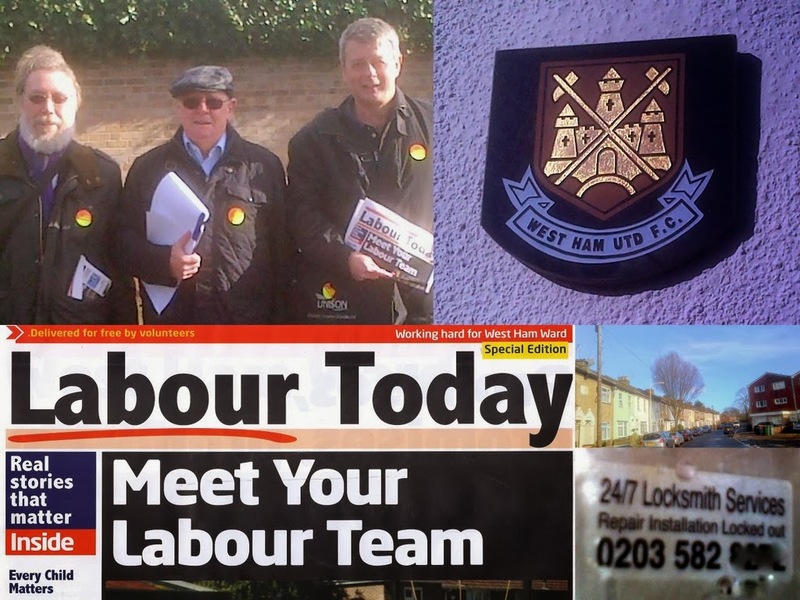 Picture collage is from last Saturday's Labour doorstep in West Ham ward. The "gang of three" on the left are West Hammers John Whitworth, Ron Manley and yours truly. One proud resident had the West Ham Football Club motif on their wall (top right). As well as door knocking we were delivering the latest newsletter "Labour Today". There was a debate with residents whether the emergency locksmith number illegally stick on everyone's letter plate in this street and elsewhere (bottom right) was a failed locksmith business venture or a "sophisticated new scam" (see Daily Mail) by burglar's to identify vulnerable properties. I have phoned the number but it has been constantly engaged. I have been told that placing the stickers on doors is probably criminal damage but there is no evidence that this was part of any wider criminal conspiracy. Surely this not mean that the Daily Mail was telling porkies?